People who have an allergy or severe sensitivity to peanuts run the risk of serious or life-threatening allergic reaction if they consume these products. Myanmar Wholesale of Maplewood, Minnesota is recalling all packages of Thanlwin brand Fried Bean Snack, because it may contain undeclared peanuts. People who have an allergy or severe sensitivity to peanuts run the risk of serious or life-threatening allergic reaction if they consume these products. 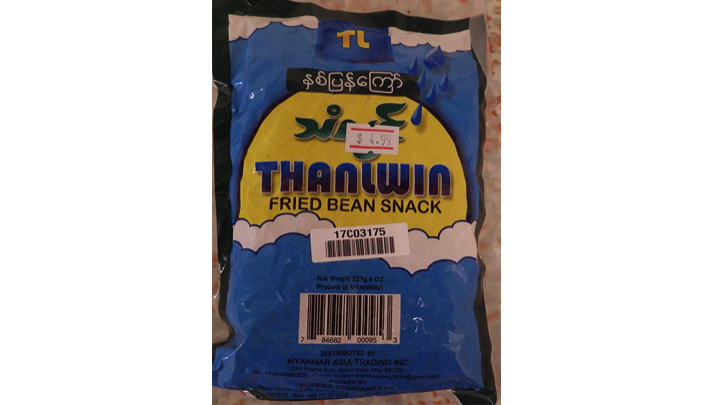 Thanlwin Fried Bean Snack was distributed nationwide thru ethnic retail grocery stores. Thanlwin Fried Bean Snack is contained in an 8 oz. (227g) plastic bag which is blue, yellow, and white on the front and clear on the backside. There is no code or expiration date on the package. Package contains UPC code 7 84682-00095 3 on front side of package. Nutrition Facts and ingredient list are on a sticker on backside of package. We haven’t received any illness have been reported to date. The recall was initiated after we were made aware that the State of New York, Department of Agriculture collected a retail sample of Thanlwin Fried Bean Snack, and found it to contain undeclared whole peanuts. The Packaging does not reveal the presence of peanuts. Consumers who have this product in their home should dispose of it or take it back to place of purchase for a refund. Consumers with questions may contact Myanmar Wholesale at 1-801-688-2800. Monday through Friday 8:00 am - 4:00 pm.